But not Valentine’s Day and Easter, oh no. These are the holidays that insist you give me chocolate and you give it to me now, in mass quantities. A stray conversation heart may sneak its way into your stash this week, but those are easily crushed. 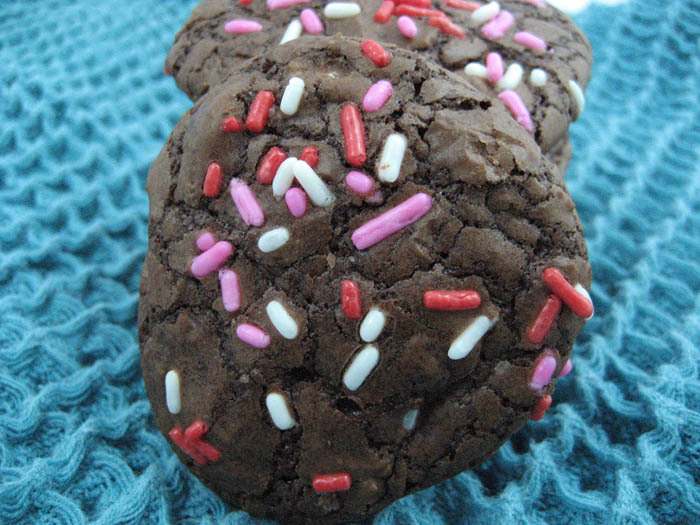 These Espresso Brownie Chocolate Chip Cookies are a lovely way of saying, Happy Stuff Your Face WIth Chocolate Day. 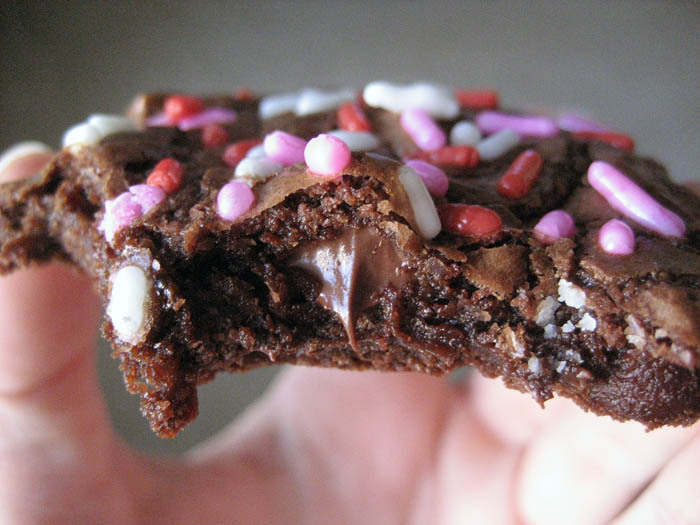 As the name suggests, they’re pretty much a brownie in cookie form (world peace solved) with a hint of espresso flavor, but not enough to scare away those who say ‘I don’t like coffee.’ The tops even get shiny and crackled like a brownie. 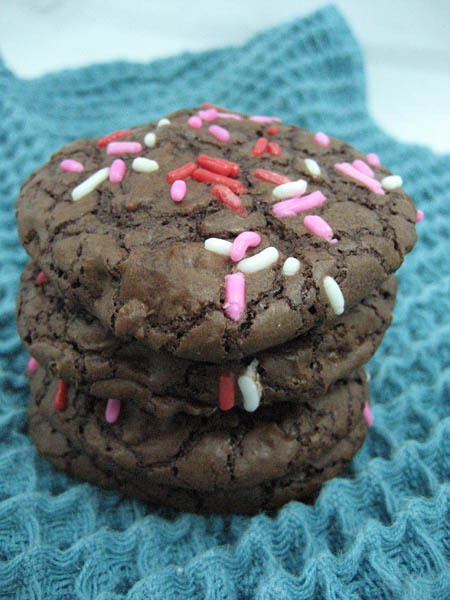 You may not know this, but I graduated from the University of Wisconsin with honors – thus my brilliant idea to put Valentine’s Day sprinkles on these cookies to get everyone in the lovey,dovey spirit. Should it be a different holiday, you could adjust your sprinkle colors, or be baking Amish and leave ’em plain and simple (but please put a hair net on that beard). This things are sinful straight out of the oven. Melt in your mouth, chocolate all over your face, give me a moment and a glass of milk sinful. Eeep. The directions suggest you chill the dough before baking. Do it. The dough is a bit runnier than your average cookie dough. I don’t have instant coffee laying around, so I used 1 tsp. espresso powder instead. Espresso powder always makes chocolate taste better. In a double boiler (a small bowl set over a larger pan of simmering water), combine the unsweetened chocolate, one cup of chocolate chips and butter, stirring until melted. Remove the smaller pan containing the chocolate from the double boiler and set it aside. In the bowl of a stand mixer fitted with the whisk attachment, whisk the eggs, sugar and instant coffee granules on high speed until very thick and mixture forms a ribbon when whisk is lifted, about three minutes. Slowly add the chocolate mixture to the bowl, whisking just until combined. Turn off the stand mixer. Sift the flour, baking powder and salt into the bowl and stir just until combined. Stir in the remaining one cup of chocolate chips. Refrigerate dough for 30 minutes. Portion heaping tablespoons of batter about 2 inches apart on a parchment- or Silpat-lined baking sheet. Keep dough in refrigerator between batches. 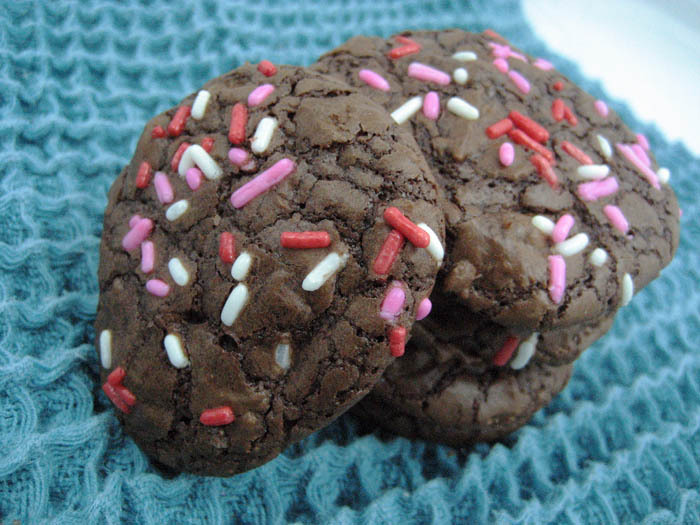 Bake for 10 to 12 minutes, or until the cookies are cracked and puffed on top. Remove the cookie sheet from the oven and allow the cookies to cool for 1 minute on the baking sheet before transferring them to a cooling rack.